Microsoft has acquired Flipgrid, the social education app that utilizes short videos to create collaborative lesson plans, online discussions, q&a formats, video vignettes and peer-to-peer student learning. The Minneapolis-based company has had strong growth for an experience that has been often been described as Instagram and Snapchat for the classroom. Early last year, it reported an 800 percent year-over-year growth in new teacher accounts. 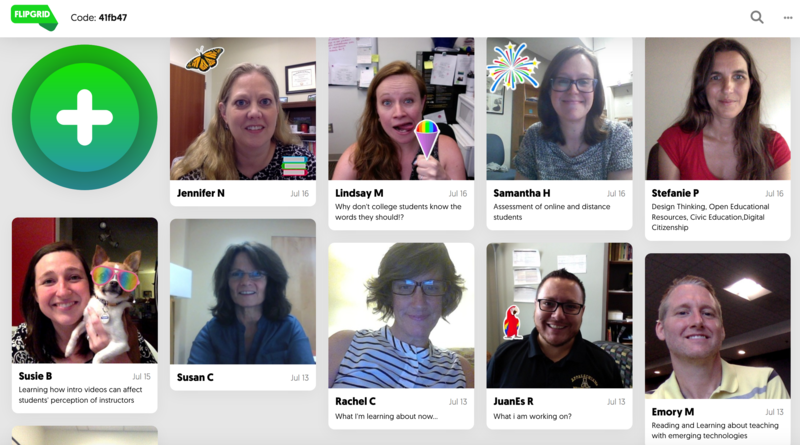 Personally, I used Flipgrid this week in preparation for the Free Learning Conference at Appalachian State University. The organizers posed a broad pre-conference question that addressed anyone who was a part of the conference– what are you learning about now? Fligrid’s journey has been a stunning success. How did a modest tool built for 12 PhD students spark the venture investment, ignite social learning in classrooms around the world, and is now part of the Microsoft portfolio? For AACE Review, I talked to Jim Leslie, the cofounder and CEO of Flipgrid. Please describe your role at Flipgrid. My role has been to define our company strategy alongside Charlie and the rest of our amazing team of engineers and community engagement leaders, oversee our business operations, and engage and support our external stakeholders including educators, partners, and investors. What are some of the ways you are personally using the Flipgrid platform? I’ve had firsthand experience using Flipgrid for school faculty recruiting (separate Grids for candidates to engage selection committees before and after site visits), conference attendee engagement pre- and post- event, as a virtual photo booth for wedding guests both at the wedding and reception and those out of town. There is no limit to the creativity we’ve seen people bring to the Flipgrid community. Can you share some of your favorite classroom ideas around Flipgrid? I love every example where a student feels more confident and supported sharing his or her voice with classmates, experts, communities, and their peers across the globe. My favorite part of Flipgrid is that each educator makes the experience authentic and most impactful for their students based upon their unique circumstances. Flipgrid is an unusual success story of a tool developed in a higher education environment reaching a large market. What were some of the milestones and decisive moments in this journey? The most important milestone for Flipgrid is the passionate support we’ve received from PreK – PhD educators. We welcome tens of thousands of new educators to Flipgrid every month simply based upon the recommendations of their friends and colleagues. Flipgrid isn’t what our small team in Minneapolis built…it is the community created by educators for educators and their students. Can you explain the changes that will come for Flipgrid as part of Microsoft? We will be announcing all of our new capabilities for the 2019 school year on August 1st. Follow us on Twitter at #FlipgridLIVE or visit www.flipgrid.com for information on how to watch the event’s live stream. What are your next endeavors? Do you have new things planned for Flipgrid? We have a lot planned for Flipgrid plus our community will undoubtedly continue to lead us into new services and capabilities. The best way to keep on top of Flipgrid developments is to follow us on twitter – @flipgrid. Are you working on any other innovative tools? Yes. Many of them! Check out blog.flipgrid.com and follow our very own Educator Innovator Jornea Erwin – @Savvy_Educator – for incredible ways to appsmash Flipgrid! Conference attendees at the upcoming E-Learn conference in Las Vegas will have an opportunity to meet you in person. Can you tell us what you will be doing at E-Learn 2018? I have two goals for E-Learn 2018. First, I want to meet with as many educators as possible to hear how we can help them encourage and amplify student voice. Second, I’ll be sharing my experiences and observations of education at the “Kickoff Keynote + Fireside Chat”, right before the happy hour welcome celebration. Devers, C., Conrad, J., Devers, E., Cook, M. & Alayan, A. (2016). Video and Written Discussions. In Proceedings of EdMedia 2016–World Conference on Educational Media and Technology (pp. 1045-1048). Vancouver, BC, Canada: Association for the Advancement of Computing in Education (AACE). Retrieved July 3, 2018 from https://www.learntechlib.org/primary/p/173075/.